One of Damato's officers (As I recall the story) was interested in transferring from Destroyers to Aircraft Carriers, and was visiting aboard the USS Oriskany at the time of the take-off incident shown below. I believe he took these pictures, but I know they ended up back to the Damato where I was allowed to copy them. The first picture shows an aircraft in position for takeoff, to be assisted by a steam catapult. I was told that the catapult had just been overhauled and, as a result of an error during reassembly, applied more force to the aircraft than it should have during takeoff. One of the attachment points on the aircraft broke, so that the aircraft was pulled to one side. The pilot attempted to abort the takeoff and had the aircraft slowed almost to a stop when it reached the forward edge of the flight deck. The aircraft began to pitch over the edge. At this point the pilot ejected, and he can be seen in the picture below as a dot above the aircraft, and just below the horizon. The story did not end well. The aircraft ended up stuck in the life nets, but I understand the pilot was killed. Ironically, if he had remained in the cockpit he would have been OK. But he had to make a quick decision. 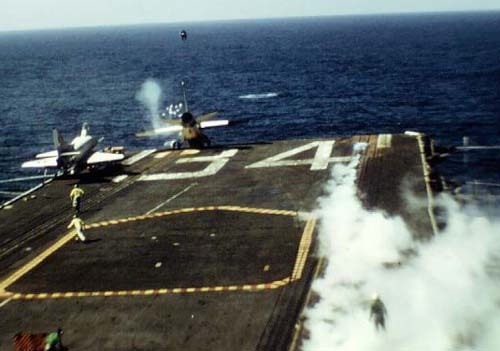 If he had hesitated a fraction of a second longer, and the aircraft had continued off the bow, it would obviously have been too late to eject.